Pasha Ancient Tea Mountain is located in Menghai county to the Southwest of Gelanghe tea mountain. The highest elevation is 1850 meters, with an average of 1700 meters (the same as Lao Banzhang mountain). This certified organic Pu-erh tea was made from selected ancient arbor leaves grown on Pasha Ancient Tea Mountain, prepared with great care by Mr. Zhou Bing Liang, the prestigious Pu-erh tea expert who is in charge of the complete tea processing methods to guarantee a premium quality. The tea features prominent silver needles producing a strong, fragrant, bright yellow tea with rich yet mellow flavor and a pleasantly sweet sensation in the mouth, although ready to drink now, but great potential after a few years of aging. 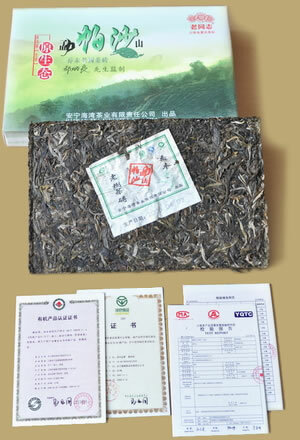 This 2009 vintage raw Pu-erh brick will make a great beginning for your own collection of Pu-erhs.